The Mariners moved into Blundell Park in 1899 from their old Abbey Road ground, taking two stands with them. In 1901 the wooden Main Stand was constructed. In 1925 the Abbey Park Stand was replaced by the Barret's Stand. In 1939 the last of the old Abbey Park ground was replaced. The Hazel Grove stand was demolished and replaced with the Osmond Stand. In 1953 floodlights arrived at Blundell Park for the first time. In 1961 the Pontoon stand was replaced by another stand of the same name. In 1980 the Main Stand was made all-seating and the Barret's Stand was replaced with the Findus Stand (now Carlsberg Stand, pictured). Following the Taylor Report the Findus Stand was made all-seating in 1995. 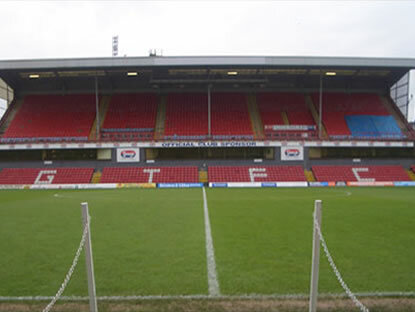 There are contradictory figures for the exact capacity of Blundell Park, however we believe it to be around 8,870. Temporary seats in the open corners made the capacity around 10,000 although they haven't been in place for a couple of years. The highest ever attendance at the ground was 31,651 for a FA Cup 5th Round match on February 20, 1937 against Wolverhampton Wanderers. Since the ground was converted to all seating for the start of the 1995-96 season after the Taylor Report, the highest attendance was 9,528 for a Football League Division One (Second Tier) match against Sunderland on March 13, 1999. Poll: Have the Mariners now turned a corner? Have the Mariners now turned a corner?